CIVIQ supplied six premium dual-height drinking fountain and bottle refill stations to Adelaide Airport, ensuring an accessible and hygienic source of drinking water for all passengers. The supply and installation of these drinking water dispensers followed a survey conducted in 2016 by Adelaide Airport among passengers, with the feedback revealing the lack of a dedicated area in the terminals that would allow travellers to fill up their drink bottles before boarding their flights. To address the problem of drinking water amenities, Adelaide Airport sought a robust drinking water dispensing solution that could withstand high usage rates, be accessible for all users, and blend in seamlessly with the modern terminal architecture. 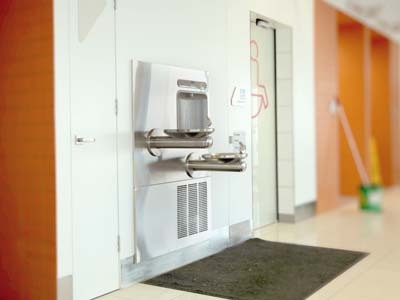 Following a consultation with airport managers, CIVIQ presented a number of solutions including a range of Elkay wall mounted drinking fountains ideally suited to indoor public environments. The Elkay SwirlFlo bi-level fountain with integral EZH2O bottle filling station was selected due to its all-on-one drinking fountain and bottle refill functionalities, inbuilt refrigeration and water filtration, and smart looks. Key features of the Elkay SwirlFlo include dual height design of the drinking fountain basin allowing easy access for young children as well as wheelchair users; bottle filler’s sanitary no-touch sensor providing users with a fast and hands-free way to fill up their drink bottles; and in-wall installation allowing for a seamless, flush wall finish. CIVIQ Sales Representative Brittany Thompson worked with facility managers to oversee the product selection and installation. “Adelaide Airport was great to work with. The Elkay SwirlFlo EZH2O is a great fit for the airport environment because the dual-height design of the unit means that everyone has access to drinking water. Six brand new Elkay SwirlFlo EZH2O drinking water stations are now available for both domestic main airport passengers and international travellers prior to immigration and on arrival at Adelaide Airport. There are several dedicated areas for travellers to fill up their water bottles in easily identifiable and accessible circulation and lounge zones. The drinking water stations are not only keeping patrons hydrated, but are also encouraging users to move away from generating unnecessary waste from single-use water bottles.